"A differential relay responds to vector difference between two or more similar electrical quantities "
2- The two or more quantities should be similar i.e. current/current. 3- The relay responds to the vector difference between the tow i.e. to I1-I2, which includes magnitude and/or phase angle difference. Differential protection is generally unit protection. The protected zone is exactly determined by location of CT's and VT's. The vector difference is achieved by suitable connections of current transformer or voltage transformer secondaries. Most differential relays are current differential relays in which vector difference between the current entering the winding and current leaving the winding is used for sensing and relay operation. Differential protection principle is used in the following applications. - Protection of generator, protection of generator transformer unit. - Protection of feeder (transmission line) by pilot wire differential protection. - Protection of transmission line by phase comparison carrier current protection. - Protection of large motor. Fig. (1-a) illustrates the principle of differential protection of generator and transformer, X is the winding of the protected machine. Where there is no internal fault, the current entering in X is equal in phase and magnitude to current leaving X. The CT's are of such a ratio that during the normal conditions or for external faults (Through Faults) the secondary current of CT's are equal. These current say I1 and I2 circulate in the pilot wire. The polarity connections are such the current I1 and I2 are in the same direction of pilot wire during normal condition or external faults. Relay operation coil is connected at the middle of pilot wires. Relay unit is of over current type. During normal condition and external fault the protection system is balanced and the CT's ratios are such that secondary currents are equal. These current circulate in pilot wires. The vector differential current I1- I2 which flow through the relay coil is zero. This balance is disturbed for internal faults. When fault occurs in the protected zone, the current entering the protected winding is no more equal to the leaving the winding because some current flows to the fault. The differential I1-I2 flows through the relay operation coil and the relay operates if the operating torque is more than the restraining torque. The current I1 and I2 circulate in the secondary circuit. Hence CT's does not get damaged. Polarities of CT's are considered. CT's are connected such that the circulating currents I1 and I2 are as shown in Fig. (1-a) for normal condition. i) Inherent difference in CT characteristic arising out of difference in magnetic circuit, saturation conditions etc. ii) Unequal d.c. component in the short circuit current. 4.3 Saturation of CT magnetic circuit during short circuit condition. Due to these causes the relay may operate even for external faults. The relay may loose its stability for through faults. To overcome these difficulty, the percentage differential relay, or 'Based Differential Relay' is used. 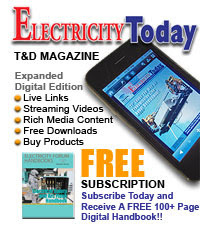 It is essentially a circulating current differential relay which additional restraining coil. The current flowing in restraining coil proportional to (I1+I2)/2 and this restraining current prevents the operation during external faults. Because, with the rise in current, the restraining torque increases and I1-I2 arising out of difference in CT ratio is not enough to cause the relay operation. 4.4 Magnetizing current inrush in transformer while switching in. When the transformer is connected to supply, a large (6 to 10 times full load) current inrush takes place. This certainly causes operation of differential relay current inrush takes place. This certainly causes operation of differential relay though is no fault in the transformer. 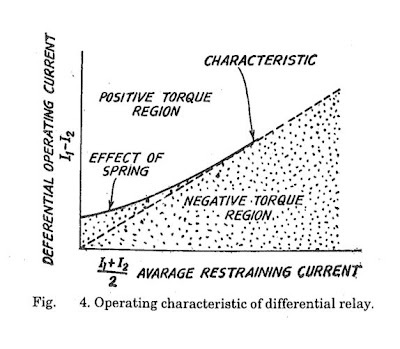 To avoid this difficulty harmonic restraint is provided for the differential relay. This relay filter the harmonic component from the inrush current and feeds it to the restraining coil. 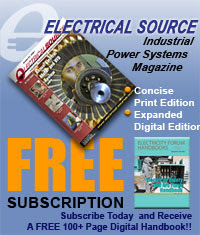 The coil magnetizing current contains a large content of several harmonics. This harmonic content is used for obtaining restraining torque during switching in of transformer. 4.5 Tap changing. The tap changing causes change in transformation ratio of a transformer. Thereby the CT ratio do not match with the new tap settings, resulting in current in pilot wires even during health condition. This aspect is taken care of by biased differential relay. Referring to Fig. (2) during the normal conditions the three secondary currents of CT's are balanced and current flows through the relay coil. 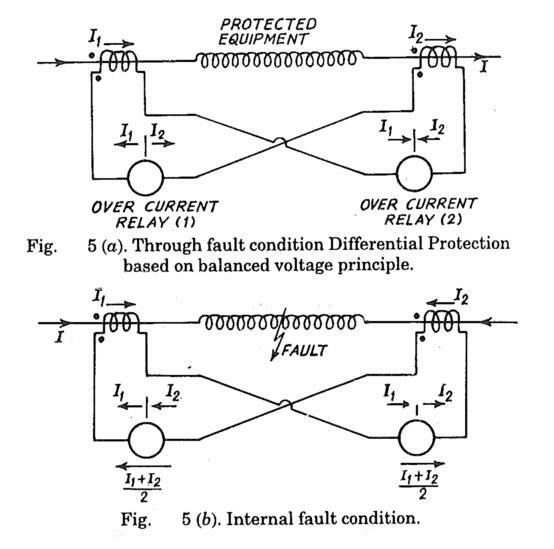 During fault in the protected zone, the balance is distributed and differential current flows through the relay operating coil. The differential current is above the pick up value, the relay operates. The reason for using this modification is circulating current current differential relay is to overcome the trouble arising out of differences in CT ratios for high values of external short circuit currents. (Refer the previous paragraph). The percentage differential relay has an additional restraining coil connected in the pilot wire as shown in Fig. (3). In this relay the operating coil is connected to the mid-point of the restraining coil becomes the sum of ampere turns in its tow halves, i.e (I1N/2) + (I2N/2) which gives the average restraining current of (I1 + I2)/2 in N turns. For external faults both I1 and I2 increase and thereby the restraining torque increases which prevents the mal-operation. The operating characteristic of such a relay is given in Fig. (4). 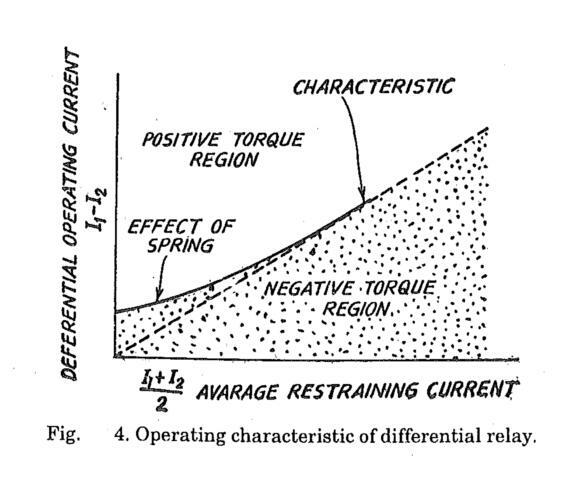 The ratio of differential operating current to average restraining current is Fixed percentage. Hence the relay is called 'percentage differential relay'. The relay is so called 'Based differential relay' because the restraining coil is also called a biased coil as it provides additional flux. The percentage of biased differential relay has a rising single pick up characteristic. As the magnitude of through current increases, the restraining current decreases. - Setting of operating coil circuit. - Setting of restraining coil circuit. In case of power transformers, percentage basic setting is of the order of 20 % and percentage pick-up value of the order of 25%. Fig. 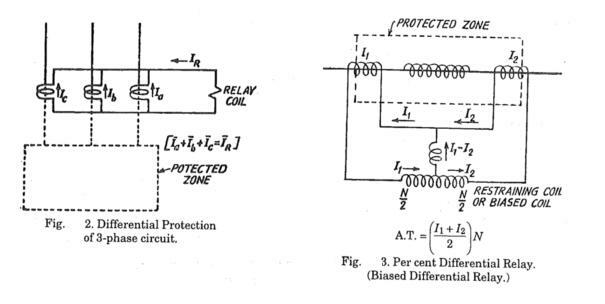 (5) illustrates the principle of differential protection based on balanced voltage principle. 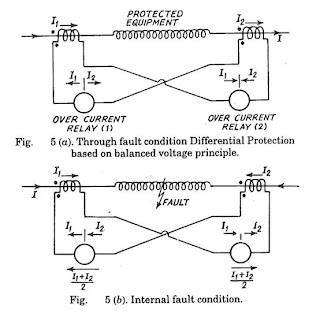 In this the secondaries of CT's are connected such that for normal conditions and through fault conditions, the secondary current of CT's on tow sides opposes each other and their voltage are balanced Fig. (5-a). During internal fault, the condition changes as illustrated in Fig. (5-b) an equivalent current (I1 +I2)/2 flows through relay coils at each end. The current transformer used in such protection are with air gap core so that the core does not get saturated and overvoltages are not produced during zero secondary current under working normal condition.